Is this Vangelis, Jarre or Yello? No. Is this a Electronic Crossover? Somehow. Is this Klangwelt? Definitely! To present a CD on my label that has an unusual fascination, is a very special matter. „The Incident“ is something special, because on his 4th album Gerald Arend aka Klangwelt manages to make a blend of extraordinary elements and selected sounds to produce an unusual and captivating opus. Soft and warm harmonies meet technical sounds, dreamy melodies meet bizarre tone patterns. Accentuated Beats, Sequences, sometimes minimalistic at another time powerful, Cosmic Spheres and Speech Quotes are put together to exciting compositions, that are accompanied by bizarre and sometimes excentric sound creations and strange vocal-samples. The atmospherically-flowing tracks seem to play with feelings of wellness and threat which sometimes arouse tension and power, at another time let you calm down again. Dreamy atmospheres are interwoven by decent discords and strange parts are enriched by harmonic elements, traditional sounds are combined with innovative sound experiments. A fantastic, excellent produced sound travel, full of charming contrasts. Recommended (not only) to all Klangwelt-fans. Yes, Klangwelt is still alive! After more than 12 years of absence, Gerald Arend returns in great shape with an album as unexpected as always very stylized and in the purest Klangwelt tradition. How to describe “The Incident” Melancholic, full of melodies and catchy rhythms, but especially eclectic and without borders! Let's take "Exclamation". Its opening does very Orbital (The Girl with the Sun in her Head) with these synth lines whistling like leaves in suspension. Metallic effects, jerky pulsations and vocoder effects lead us to a rhythmic structure that rolls in circle, in harmony with the clatter of the cymbals, up until crashing into a wall of sound effects. One hundred and twenty seconds later, a synth is trumpeting a huge tune, while dozens of little distraught steps are forming a rhythm between EDM and New Berlin School. Quite rich in sounds and effects, the music and the harmonies of "Exclamation" also sail through nice orchestrat i ons and voice effects on the edge of panic, while the pace remains lively and sometimes even heavy. The title-track follows with a sound vision of a morning in the countryside. A keyboard puts down its melancholic notes while a collage of sound effects and voices rely on a structure of rhythm which seeks to hatch. The first musical itch arrives some 2 minutes later. Nostalgic, the melody becomes a joyful tune but with a shadow of gloom in its depth. As for the rhythm, it explodes, between a phase of ambiospheric and ambiosonic elements, with a crystalline vitality on where get grafted a multitude of effects which captivate the ears. 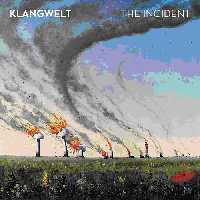 Even after 12 years of absence, Klangwelt fans will be on familiar ground with the music and the moods of “The Incident”. The 14 chapters compose a soundtrack of a slice of life that Klangwelt reveals on a continuous mosaic which carries the weight of its 80 minutes quite well. Riding on the influences of Enigma, Orbital and Yello, Gerald Arend sprin kles copiously these chapters of sound effects, as sought after as very effective, of voices and narrations which play on the different degrees of this album's emotions. The rhythms are still close to the borders of EDM, Synth-Pop and of Tangerine Dream's Electronic Rock from the Miramar years with a bit of New Berlin School's essences. Obviously, there are some beautiful earworms which will haunt our distracted songs for a couple of hours. "Fragments I" is a title of ambiences which hangs onto its structure of uncertain rhythm filled of the harmonic filaments of the title-track. Its decor fades in the very ambient "Time Freeze I". The story gets written little by little and brings us to the clinking of the clock chimes of "Rêve Mécanique". A deep voice attempts a hypnotic approach in a din of bells and chimes, from which a line of rhythmic pulsations emerges. The flow is slow and the decor is of the East. "Rêve Mécanique" gradually develops a cinematographic vision with its fragra n ces of Arabia which embrace a slow structure in its rhythmic development before reaching an intensely rhythmic finale. "Sirens" develops a 2nd earworm with tribal songs on a structure whose harmonious approach and orchestration effects flirt with that of Mike Oldfield in Songs of a Distant Earth. "Fragments II" puts down a carpet of intensity that just overflows on "Evocation" and its down-tempo of which the impulses are retained by ambiospheric phases rich in variegated and especially very stylized tones. The sound research and aesthetics of Klangwelt are the essential essences of his universe. Here, the German synthesist surpasses himself by multiplying his palettes of tones which are real elements of surprise in this setting where the sadness is never really far away. "Time Freeze II" is a beautiful melodious interlude that gives goosebumps when our ears meet the musical visions of “The Incident”. "Aftermath" starts a new segment in this story. Detached from "Time Freeze II" , it gradually develops its down-tempo from a good bass and from sober percussions which will become the cornerstone of a development in rollercoaster. But in the end, the meshing of percussion and percussive elements here is simply exquisite. We also find these essences of Mike Oldfield and especially Vangelis (period 95-96) at the level of the harmonic arrangements. A great title which brings us to "Scars" and its slow structure that gives us a thousand shivers on the shroud of our emotions. We reach, I guess, the pinnacle of “The Incident”. "Fragments III" is as intense and melodic as "Time Freeze II", while "Neon Tribes" ends its ambiospheric cruise in a fiery and very EDM rhythmic structure. "Decades" finishes this very nice comeback of Klangwelt with another ear-worm. Transient, the introduction leaves its ambient electronic decor for an acoustic guitar which scratches a seraphic rhythm. The structure is mainly built on voice effects, a bit like Vangelis in Voices, who sing w i th birds in a heavenly setting, concluding one of the most beautiful musical stories of the recent years. Like the first 3 albums of Klangwelt, “The Incident” is this kind of opus which insidiously leaves its imprints between our ears. Gerald Arend's harmonious approach is captivating, sometimes even very overwhelming. And inserted between phases of ambiences, where the turbulence of the tones is as dense as very creative, and these rhythms not quite defined but always close to the EDM or New Berlin School, it makes its bed where we like to lie down our stories.